Don’t panic, we understand that as experts in leasing we tend to use certain words and phrases which you may have never heard before now! This is why we have created a Jargon Buster, so you can talk the lingo with us. 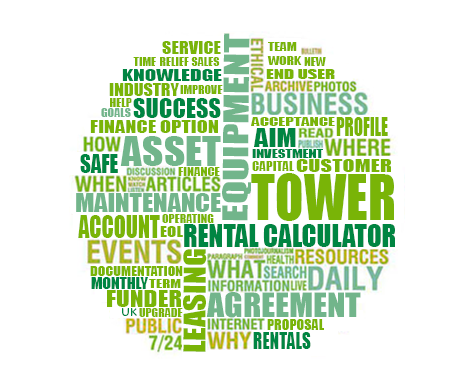 A sole trader / company / organisation that requires leasing for equipment. A company that supplies the equipment to the lessee. An organisation that provides funding to the lessee / customer. Document detailing information required for credit clearance. This is a term we would use when we have all of funds in place to accept the deal for credit. Is the value of the equipment the supplier is providing to the lessee. This is the dedicated person at Tower Leasing that will be looking after you for the duration of your lease or any future leases you may do with us. These are here to give you an idea of what your rentals would be for your desired equipment. As these are not set in stone they can be tailored to your needs. A deal is activated once we have paid the dealer / equipment supplier for the equipment on the lease. We would only do this once we have received cleared funds from the funder. A lessee may choose to upgrade the equipment they have leased to a newer version. We can offer the lessee an upgrade on their current lease to accommodate the new equipment. The rentals would be adjusted accordingly. The price at which a manufacturer suggests a product should be sold on the retail market, though this may be reduced by the retailer. All of the equipment that we lease will have a fair market price. An operating lease is a type of finance that has historically enabled customers to invest in high value items with a long life span such as airplanes, ships and heavy duty trucks. To find out more please contact us. The payments made by the lessee in respect of the agreement lease. These would normally be either quarterly or monthly. A sales aid tool that helps the supplier work out rentals in accordance with the equipment cost. The term is how many months a lease lasts for. For example a 5 year lease would have a 60 month term. This is how many payments are required for the term of the lease. For example a 5 year lease on a quarterly basis would show as a 1 + 19 because there are 4 quarters per year. The lessee can opt to pay a maintenance charge on a lease subject to clearance. Payments made our fully comprehensive. The supplier/ dealer normally provides the maintenance service. Funding sources supplied on a direct basis. This is where the lessee / dealer wants to prematurely end the lease. This would involve a settlement cost. This would normally be made up of the remaining future rentals at a discounted rate in accordance with the Lease Agreement contract. We don’t just lease brand new equipment, if a lessee wants to lease a second hand / re-furbished piece of equipment we can also offer a leasing option. This is an abbreviation for End Of Lease, this is the department that will look after you as your lease comes to an end. What type of finance do you require? Any additional info that may help us with the quote?